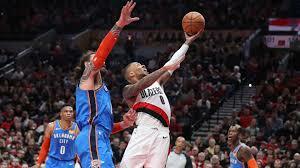 PORTLAND- The Portland Trail Blazers jumped to a 39-25 lead in the opening quarter and then held off the Oklahoma City Thunder the rest of the way to take Game 1 of their opening round series, 104-99, on Sunday (Manila time) at the Moda Center. All-Star point guard Damian Lillard led the charge with 30 points, four rebounds and four assists. He converted 9-of-21 field goals, including 5-of-11 from 3-point distance. Lillard's backcourt tandem, C.J. McCollum, finished with 24 points, but he made only nine of 24 shots and showed a lot of rust after just recently coming back from a ten-game absence due to a knee injury. "We know how it feels to win again," Lillard told reporters after the game. In the past two postseasons, Portland has lost eight straight as they were swept by the Golden State Warriors in 2007 and by the New Orleans Pelicans last year. Enes Kanter, who started in place of the injured Jusuf Nurkic, was a huge reason for the turnaround. Kanter, waived by the New York Knicks during February trading deadline, scored 20 points and hauled 18 rebounds. Al-Farouq Aminu contributed 10 points for Portland, which 36 of 86 field goals. After closing the gap at 54-48 at halftime, the Thunder put the added pressure in the fourth quarter and came to within 93-92 with 2:44 left to play. But uprising ended abruptly when Lillard sank a 30-foot 3 to extend the lead back to four. Russell Westbrook fueled much of Oklahoma's attack with a triple-double effort that netted him 26 points, 10 rebounds and 10 assists. Fellow All-Star Paul George accounted for 24 points and 10 rebounds, but he struggled greatly from beyond the arc, missing 11 of 15 tries. Game 2 of this best-of-7 series returns to the Moda Center on Tuesday night (Wednesday AM Manila time). Click here to view a list of other articles written by Nicky Manguino.